MANILA — A former overseas worker who police said was jailed for five years in Saudi Arabia for drug peddling was arrested on Wednesday for allegedly resuming his criminal activity on a larger scale. Although he was caught in a buy-bust operation in Quezon City, Abdulla Magarang was presented on Thursday to San Juan Mayor Guia Gomez and Vice Mayor Janella Estrada of San Juan City, where the police said his “bigtime” operation thrived. Magarang, 49, and his 29-year-old driver Teejay Sammy Calub met with a poseur buyer around 3 a.m. in front of an apartelle on Kamuning Road. By then, the police had tailed their gray Honda CRV starting from San Juan. Senior Supt. Victor Arevalo, the San Juan police chief, said the two suspects were caught with 70 grams of “shabu” worth P98,000 when they met the undercover officer, who had asked for only P3,000 worth of the drug. 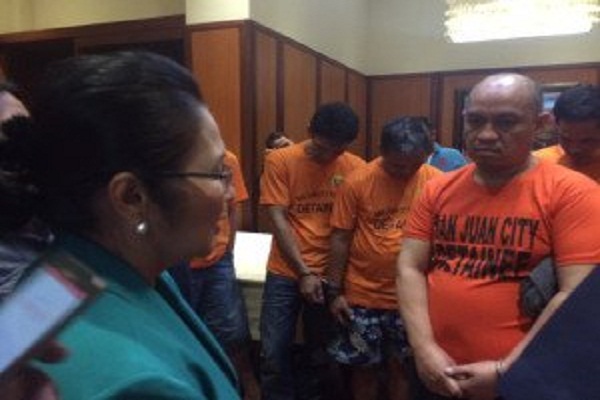 Magarang had been operating as a pusher in San Juan for a year, “selling in bulk in transactions that can be worth half a million pesos each,” Arevalo said. He allegedly got his supply from Quiapo, Manila. In San Juan, most of his buyers were in Barangay San Perfecto, Arevalo added. Although “jobless,” Magarang owns at least two condominium units on Aurora Boulevard, Quezon City, according to a report by Chief Insp. Hoover Pascual, chief of the San Juan police anti-illegal drugs unit. The suspect did not deny this when arrested. A native of Iligan City, Magarang spent five years in jail in Jeddah, Saudi Arabia, on drug charges, investigators told the Philippine Daily Inquirer. The circumstances leading to his release in Jeddah were not immediately known. Facing Gomez, he admitted being a drug user but denied being a pusher. Before getting Magarang and Calub, the San Juan police have arrested 15 drug suspects since the start of the month.